"Baptist" redirects here. For the Christian sacrament, see Baptism. For other uses, see Baptist (disambiguation). Baptists are Christians distinguished by baptizing professing believers only (believer's baptism, as opposed to infant baptism), and doing so by complete immersion (as opposed to affusion or sprinkling). Baptist churches also generally subscribe to the tenets of soul competency/liberty, salvation through faith alone, scripture alone as the rule of faith and practice, and the autonomy of the local congregation. Baptists generally recognize two ordinances: baptism and the Lord's supper. Diverse from their beginning, those identifying as Baptists today differ widely from one another in what they believe, how they worship, their attitudes toward other Christians, and their understanding of what is important in Christian discipleship. Historians trace the earliest "Baptist" church to 1609 in Amsterdam, Dutch Republic with English Separatist John Smyth as its pastor. In accordance with his reading of the New Testament, he rejected baptism of infants and instituted baptism only of believing adults. Baptist practice spread to England, where the General Baptists considered Christ's atonement to extend to all people, while the Particular Baptists believed that it extended only to the elect. Thomas Helwys formulated a distinctively Baptist request that the church and the state be kept separate in matters of law, so that individuals might have freedom of religion. Helwys died in prison as a consequence of the religious conflict with English dissenters under King James I. In 1638, Roger Williams established the first Baptist congregation in the North American colonies. In the 18th and 19th centuries, the First and Second Great Awakening increased church membership in the United States. Baptist missionaries have spread their faith to every continent. the successionist view, or "Baptist successionism", which argues that Baptist churches actually existed in an unbroken chain since the time of Christ. During the Protestant Reformation, the Church of England (Anglicans) separated from the Roman Catholic Church. There were some Christians who were not content with the achievements of the mainstream Protestant Reformation. There also were Christians who were disappointed that the Church of England had not made corrections of what some considered to be errors and abuses. Of those most critical of the Church's direction, some chose to stay and try to make constructive changes from within the Anglican Church. They became known as "Puritans" and are described by Gourley as cousins of the English Separatists. Others decided they must leave the Church because of their dissatisfaction and became known as the Separatists. Historians trace the earliest Baptist church back to 1609 in Amsterdam, with John Smyth as its pastor. Three years earlier, while a Fellow of Christ's College, Cambridge, he had broken his ties with the Church of England. Reared in the Church of England, he became "Puritan, English Separatist, and then a Baptist Separatist," and ended his days working with the Mennonites. He began meeting in England with 60–70 English Separatists, in the face of "great danger." The persecution of religious nonconformists in England led Smyth to go into exile in Amsterdam with fellow Separatists from the congregation he had gathered in Lincolnshire, separate from the established church (Anglican). Smyth and his lay supporter, Thomas Helwys, together with those they led, broke with the other English exiles because Smyth and Helwys were convinced they should be baptized as believers. In 1609 Smyth first baptized himself and then baptized the others. In 1609, while still there, Smyth wrote a tract titled "The Character of the Beast," or "The False Constitution of the Church." In it he expressed two propositions: first, infants are not to be baptized; and second, "Antichristians converted are to be admitted into the true Church by baptism." Hence, his conviction was that a scriptural church should consist only of regenerate believers who have been baptized on a personal confession of faith. He rejected the Separatist movement's doctrine of infant baptism (paedobaptism). Shortly thereafter, Smyth left the group, and layman Thomas Helwys took over the leadership, leading the church back to England in 1611. Ultimately, Smyth became committed to believers' baptism as the only biblical baptism. He was convinced on the basis of his interpretation of Scripture that infants would not be damned should they die in infancy. Smyth, convinced that his self-baptism was invalid, applied with the Mennonites for membership. He died while waiting for membership, and some of his followers became Mennonites. Thomas Helwys and others kept their baptism and their Baptist commitments. The modern Baptist denomination is an outgrowth of Smyth's movement. Baptists rejected the name Anabaptist when they were called that by opponents in derision. McBeth writes that as late as the 18th century, many Baptists referred to themselves as "the Christians commonly—though falsely—called Anabaptists." Another milestone in the early development of Baptist doctrine was in 1638 with John Spilsbury, a Calvinistic minister who helped to promote the strict practice of believer's baptism by immersion. According to Tom Nettles, professor of historical theology at Southern Baptist Theological Seminary, "Spilsbury's cogent arguments for a gathered, disciplined congregation of believers baptized by immersion as constituting the New Testament church gave expression to and built on insights that had emerged within separatism, advanced in the life of John Smyth and the suffering congregation of Thomas Helwys, and matured in Particular Baptists." Print from Anglican theologian Daniel Featley's book, "The Dippers Dipt, or, The Anabaptists Duck'd and Plung'd Over Head and Ears, at a Disputation in Southwark", published in 1645. A minority view is that early-17th-century Baptists were influenced by (but not directly connected to) continental Anabaptists. According to this view, the General Baptists shared similarities with Dutch Waterlander Mennonites (one of many Anabaptist groups) including believer's baptism only, religious liberty, separation of church and state, and Arminian views of salvation, predestination and original sin. Representative writers including A.C. Underwood and William R. Estep. Gourley wrote that among some contemporary Baptist scholars who emphasize the faith of the community over soul liberty, the Anabaptist influence theory is making a comeback. However, the relations between Baptists and Anabaptists were early strained. In 1624, the then five existing Baptist churches of London issued a condemnation of the Anabaptists. Furthermore, the original group associated with Smyth and popularly believed to be the first Baptists broke with the Waterlander Mennonite Anabaptists after a brief period of association in the Netherlands. Traditional Baptist historians write from the perspective that Baptists had existed since the time of Christ. However, the Southern Baptist Convention passed resolutions rejecting this view in 1859. Proponents of the Baptist successionist or perpetuity view consider the Baptist movement to have existed independently from Roman Catholicism and prior to the Protestant Reformation. The perpetuity view is often identified with The Trail of Blood, a booklet of five lectures by J.M. Carrol published in 1931. Other Baptist writers who advocate the successionist theory of Baptist origins are John T. Christian, Thomas Crosby, G. H. Orchard, J. M. Cramp, William Cathcart, Adam Taylor and D. B. Ray This view was also held by English Baptist preacher, Charles Spurgeon as well as Jesse Mercer, the namesake of Mercer University. 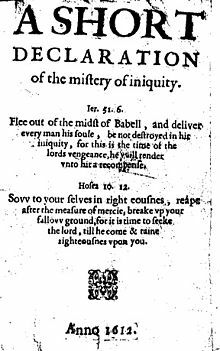 A Short Declaration of the Mistery of Iniquity (1612) by Thomas Helwys. For Helwys, religious liberty was a right for everyone, even for those he disagreed with. In 1612, Thomas Helwys established a Baptist congregation in London, consisting of congregants from Smyth's church. A number of other Baptist churches sprang up, and they became known as the General Baptists. The Particular Baptists were established when a group of Calvinist Separatists adopted believers' Baptism. [page needed] The Particular Baptists consisted of seven churches by 1644 and had created a confession of faith called the First London Confession of Faith. Both Roger Williams and John Clarke, his compatriot and coworker for religious freedom, are variously credited as founding the earliest Baptist church in North America. In 1639, Williams established a Baptist church in Providence, Rhode Island, and Clarke began a Baptist church in Newport, Rhode Island. According to a Baptist historian who has researched the matter extensively, "There is much debate over the centuries as to whether the Providence or Newport church deserved the place of 'first' Baptist congregation in America. Exact records for both congregations are lacking." The Great Awakening energized the Baptist movement, and the Baptist community experienced spectacular growth. Baptists became the largest Christian community in many southern states, including among the black population. Baptist missionary work in Canada began in the British colony of Nova Scotia (present day Nova Scotia and New Brunswick) in the 1760s. The first official record of a Baptist church in Canada was that of the Horton Baptist Church (now Wolfville) in Wolfville, Nova Scotia on 29 October 1778. The church was established with the assistance of the New Light evangelist Henry Alline. Many of Alline's followers, after his death, would convert and strengthen the Baptist presence in the Atlantic region. [page needed] Two major groups of Baptists formed the basis of the churches in the Maritimes. These were referred to as Regular Baptist (Calvinistic in their doctrine) and Free Will Baptists. In May 1845, the Baptist congregations in the United States split over slavery and missions. The Home Mission Society prevented slaveholders from being appointed as missionaries. The split created the Southern Baptist Convention, while the northern congregations formed their own umbrella organization now called the American Baptist Churches USA (ABC-USA). The Methodist Episcopal Church, South had recently separated over the issue of slavery, and southern Presbyterians would do so shortly thereafter. The Baptist churches in Ukraine were preceded by the German Anabaptist and Mennonite communities, who had been living in the South of Ukraine since the 16th century. The first Baptist baptism (adult baptism by full immersion) in Ukraine took place in 1864 on the river Inhul in the Yelizavetgrad region (now Kropyvnytskyi region), in a German settlement. In 1867, the first Baptist communities were organized in that area. From there, the Baptist movement spread across the south of Ukraine and then to other regions as well. One of the first Baptist communities was registered in Kiev in 1907, and in 1908 the First All-Russian Convention of Baptists was held there, as Ukraine was still controlled by the Russian Empire. The All-Russian Union of Baptists was established in the town of Yekaterinoslav (now Dnipro) in Southern Ukraine. At the end of the 19th century, estimates are that there were from 100,000 to 300,000 Baptists in Ukraine. An independent All-Ukrainian Baptist Union of Ukraine was established during the brief period of Ukraine's independence in early 20th-century, and once again after the fall of the Soviet Union, the largest of which is currently known as the Evangelical Baptist Union of Ukraine. Antiochian Orthodox of Australia and New Z.
Serbian Orthodox of Australia and New Z. Many Baptist churches choose to affiliate with organizational groups that provide fellowship without control. The largest such group in the US is the Southern Baptist Convention. There also are a substantial number of smaller cooperative groups. Finally, there are Independent Baptist churches that choose to remain independent of any denomination, organization, or association. It has been suggested that a primary Baptist principle is that local Baptist Churches are independent and self-governing, and if so the term 'Baptist denomination' may be considered somewhat incongruous. In 1905, Baptists worldwide formed the Baptist World Alliance (BWA). The BWA's goals include caring for the needy, leading in world evangelism and defending human rights and religious freedom. Though it played a role in the founding of the BWA, the Southern Baptist Convention severed its affiliation with BWA in 2004. The First Baptist Church in America located in Providence, Rhode Island. Baptists in the U.S. number 50 million people and constitute roughly one-third of American Protestants. Baptists are present in almost all continents in large denominations. The largest communities that are part of the Baptist World Alliance are in Nigeria (3.5 million) and Democratic Republic of the Congo (2 million) in Africa, India (2.5 million) and Myanmar (1 million) in Asia, the United States (35 million) and Brazil (1.8 million) in the Americas. In 1991, Ukraine had the second largest Baptist community in the world, behind only the United States. According to the Barna Group researchers, Baptists are the largest denominational grouping of born again Christians in the USA. A 2009 ABCNEWS/Beliefnet phone poll of 1,022 adults suggests that fifteen percent of Americans identify themselves as Baptists. A large percentage of Baptists in North America are found in six bodies—the Southern Baptist Convention (SBC); American Baptist Association (ABA); National Baptist Convention (NBC); National Baptist Convention of America, Inc.; (NBCA); American Baptist Churches USA (ABC); and Baptist Bible Fellowship International (BBFI). Membership policies vary due to the autonomy of churches, but the traditional method by which an individual becomes a member of a church is through believer's baptism (which is a public profession of faith in Jesus, followed by water baptism). Most baptists do not believe that baptism is a requirement for salvation, but rather a public expression of one's inner repentance and faith. Therefore, some churches will admit into membership persons who make a profession without believer's baptism. Baptists, like other Christians, are defined by school of thought—some of it common to all orthodox and evangelical groups and a portion of it distinctive to Baptists. Through the years, different Baptist groups have issued confessions of faith—without considering them to be creeds—to express their particular doctrinal distinctions in comparison to other Christians as well as in comparison to other Baptists. Most Baptists are evangelical in doctrine, but Baptist beliefs can vary due to the congregational governance system that gives autonomy to individual local Baptist churches. Historically, Baptists have played a key role in encouraging religious freedom and separation of church and state. Shared doctrines would include beliefs about one God; the virgin birth; miracles; atonement for sins through the death, burial, and bodily resurrection of Jesus; the Trinity; the need for salvation (through belief in Jesus Christ as the Son of God, his death and resurrection); grace; the Kingdom of God; last things (eschatology) (Jesus Christ will return personally and visibly in glory to the earth, the dead will be raised, and Christ will judge everyone in righteousness); and evangelism and missions. Some historically significant Baptist doctrinal documents include the 1689 London Baptist Confession of Faith, 1742 Philadelphia Baptist Confession, the 1833 New Hampshire Baptist Confession of Faith, the Southern Baptist Convention's Baptist Faith and Message, and written church covenants which some individual Baptist churches adopt as a statement of their faith and beliefs. Most Baptists hold that no church or ecclesiastical organization has inherent authority over a Baptist church. Churches can properly relate to each other under this polity only through voluntary cooperation, never by any sort of coercion. Furthermore, this Baptist polity calls for freedom from governmental control. Exceptions to this local form of local governance include a few churches that submit to the leadership of a body of elders, as well as the Episcopal Baptists that have an Episcopal system. Baptists generally believe in the literal Second Coming of Christ. Beliefs among Baptists regarding the "end times" include amillennialism, dispensationalism, and historic premillennialism, with views such as postmillennialism and preterism receiving some support. The supremacy of the canonical Scriptures as a norm of faith and practice. For something to become a matter of faith and practice, it is not sufficient for it to be merely consistent with and not contrary to scriptural principles. It must be something explicitly ordained through command or example in the Bible. For instance, this is why Baptists do not practice infant baptism—they say the Bible neither commands nor exemplifies infant baptism as a Christian practice. More than any other Baptist principle, this one when applied to infant baptism is said to separate Baptists from other evangelical Christians. Baptists believe that faith is a matter between God and the individual (religious freedom). To them it means the advocacy of absolute liberty of conscience. Insistence on immersion as the only mode of baptism. Baptists do not believe that baptism is necessary for salvation. Therefore, for Baptists, baptism is an ordinance, not a sacrament, since, in their view, it imparts no saving grace. Since there is no hierarchical authority and each Baptist church is autonomous, there is no official set of Baptist theological beliefs. These differences exist both among associations, and even among churches within the associations. The doctrine of separation from "the world" and whether to associate with those who are "of the world"
The role of women in marriage. The ordination of women as deacons or pastors. Attitudes to, and involvement in the ecumenical movement. Baptists have faced many controversies in their 400-year history, controversies of the level of crises. Baptist historian Walter Shurden says the word "crisis" comes from the Greek word meaning "to decide." Shurden writes that contrary to the presumed negative view of crises, some controversies that reach a crisis level may actually be "positive and highly productive." He claims that even schism, though never ideal, has often produced positive results. In his opinion crises among Baptists each have become decision-moments that shaped their future. Some controversies that have shaped Baptists include the "missions crisis", the "slavery crisis", the "landmark crisis", and the "modernist crisis". Early in the 19th century, the rise of the modern missions movement, and the backlash against it, led to widespread and bitter controversy among the American Baptists. During this era, the American Baptists were split between missionary and anti-missionary. A substantial secession of Baptists went into the movement led by Alexander Campbell, to return to a more fundamental church. Leading up to the American Civil War, Baptists became embroiled in the controversy over slavery in the United States. Whereas in the First Great Awakening Methodist and Baptist preachers had opposed slavery and urged manumission, over the decades they made more of an accommodation with the institution. They worked with slaveholders in the South to urge a paternalistic institution. Both denominations made direct appeals to slaves and free blacks for conversion. The Baptists particularly allowed them active roles in congregations. By the mid-19th century, northern Baptists tended to oppose slavery. As tensions increased, in 1844 the Home Mission Society refused to appoint a slaveholder as a missionary who had been proposed by Georgia. It noted that missionaries could not take servants with them, and also that the board did not want to appear to condone slavery. The Southern Baptist Convention was formed by nine state conventions in 1845. They believed that the Bible sanctions slavery and that it was acceptable for Christians to own slaves. They believed slavery was a human institution which Baptist teaching could make less harsh. By this time many planters were part of Baptist congregations, and some of the denomination's prominent preachers, such as the Rev. Basil Manly, Sr., president of the University of Alabama, were also planters who owned slaves. As early as the late 18th century, black Baptists began to organize separate churches, associations and mission agencies. Blacks set up some independent Baptist congregations in the South before the American Civil War. White Baptist associations maintained some oversight of these churches. In the postwar years, freedmen quickly left the white congregations and associations, setting up their own churches. In 1866 the Consolidated American Baptist Convention, formed from black Baptists of the South and West, helped southern associations set up black state conventions, which they did in Alabama, Arkansas, Virginia, North Carolina, and Kentucky. In 1880 black state conventions united in the national Foreign Mission Convention, to support black Baptist missionary work. Two other national black conventions were formed, and in 1895 they united as the National Baptist Convention. This organization later went through its own changes, spinning off other conventions. 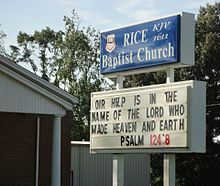 It is the largest black religious organization and the second-largest Baptist organization in the world. Baptists are numerically most dominant in the Southeast. In 2007, the Pew Research Center's Religious Landscape Survey found that 45% of all African Americans identify with Baptist denominations, with the vast majority of those being within the historically black tradition. Elsewhere in the Americas, in the Caribbean in particular, Baptist missionaries and members took an active role in the anti-slavery movement. In Jamaica, for example, William Knibb, a prominent British Baptist missionary, worked toward the emancipation of slaves in the British West Indies (which took place in full in 1838). Knibb also supported the creation of "Free Villages" and sought funding from English Baptists to buy land for freedmen to cultivate; the Free Villages were envisioned as rural communities to be centred around a Baptist church where emancipated slaves could farm their own land. Thomas Burchell, missionary minister in Montego Bay, also was active in this movement, gaining funds from Baptists in England to buy land for what became known as Burchell Free Village. Prior to emancipation, Baptist deacon Samuel Sharpe, who served with Burchell, organized a general strike of slaves seeking better conditions. It developed into a major rebellion of as many as 60,000 slaves, which became known as the Christmas Rebellion (when it took place) or the Baptist War. It was put down by government troops within two weeks. During and after the rebellion, an estimated 200 slaves were killed outright, with more than 300 judicially executed later by prosecution in the courts, sometimes for minor offenses. Baptists were active after emancipation in promoting the education of former slaves; for example, Jamaica's Calabar High School, named after the port of Calabar in Nigeria, was founded by Baptist missionaries. At the same time, during and after slavery, slaves and free blacks formed their own Spiritual Baptist movements - breakaway spiritual movements which theology often expressed resistance to oppression. Martin Luther King Jr. at the 1963 civil rights march on Washington, D.C. In the American South the interpretation of the American Civil War, abolition of slavery and postwar period has differed sharply by race since those years. Americans have often interpreted great events in religious terms. Historian Wilson Fallin contrasts the interpretation of Civil War and Reconstruction in white versus black memory by analyzing Baptist sermons documented in Alabama. Soon after the Civil War, most black Baptists in the South left the Southern Baptist Convention, reducing its numbers by hundreds of thousands or more. They quickly organized their own congregations and developed their own regional and state associations and, by the end of the 19th century, a national convention. God had chastised them and given them a special mission – to maintain orthodoxy, strict biblicism, personal piety, and "traditional" race relations. Slavery, they insisted, had not been sinful. Rather, emancipation was a historical tragedy and the end of Reconstruction was a clear sign of God's favor. Black preachers interpreted the Civil War, Emancipation and Reconstruction as: "God's gift of freedom." They had a gospel of liberation, having long identified with the Book of Exodus from slavery in the Old Testament. They took opportunities to exercise their independence, to worship in their own way, to affirm their worth and dignity, and to proclaim the fatherhood of God and the brotherhood of man. Most of all, they quickly formed their own churches, associations, and conventions to operate freely without white supervision. These institutions offered self-help and racial uplift, a place to develop and use leadership, and places for proclamation of the gospel of liberation. As a result, black preachers said that God would protect and help him and God's people; God would be their rock in a stormy land. The Southern Baptist Convention supported white supremacy and its results: disenfranchising most blacks and many poor whites at the turn of the 20th century by raising barriers to voter registration, and passage of racial segregation laws that enforced the system of Jim Crow. 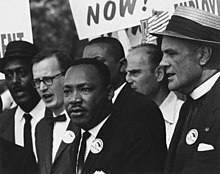 Its members largely resisted the civil rights movement in the South, which sought to enforce their constitutional rights for public access and voting; and enforcement of midcentury federal civil rights laws. On 20 June 1995, the Southern Baptist Convention voted to adopt a resolution renouncing its racist roots and apologizing for its past defense of slavery. More than 20,000 Southern Baptists registered for the meeting in Atlanta. The resolution declared that messengers, as SBC delegates are called, "unwaveringly denounce racism, in all its forms, as deplorable sin" and "lament and repudiate historic acts of evil such as slavery from which we continue to reap a bitter harvest." It offered an apology to all African Americans for "condoning and/or perpetuating individual and systemic racism in our lifetime" and repentance for "racism of which we have been guilty, whether consciously or unconsciously." Although Southern Baptists have condemned racism in the past, this was the first time the convention, predominantly white since the Reconstruction era, had specifically addressed the issue of slavery. The statement sought forgiveness "from our African-American brothers and sisters" and pledged to "eradicate racism in all its forms from Southern Baptist life and ministry." In 1995 about 500,000 members of the 15.6-million-member denomination were African Americans and another 300,000 were ethnic minorities. The resolution marked the denomination's first formal acknowledgment that racism played a role in its founding. Southern Baptist Landmarkism sought to reset the ecclesiastical separation which had characterized the old Baptist churches, in an era when inter-denominational union meetings were the order of the day. James Robinson Graves was an influential Baptist of the 19th century and the primary leader of this movement. While some Landmarkers eventually separated from the Southern Baptist Convention, the movement continued to influence the Convention into the 20th and 21st centuries. For instance, in 2005, the Southern Baptist International Mission Board forbade its missionaries to receive alien immersions for baptism. Charles Spurgeon later in life. The rise of theological modernism in the latter 19th and early 20th centuries also greatly affected Baptists. The Landmark movement, already mentioned, has been described as a reaction among Southern Baptists in the United States against incipient modernism . In England, Charles Haddon Spurgeon fought against modernistic views of the Scripture in the Downgrade Controversy and severed his church from the Baptist Union as a result. The Northern Baptist Convention in the United States had internal conflict over modernism in the early 20th century, ultimately embracing it. Two new conservative associations of congregations that separated from the Convention were founded as a result: the General Association of Regular Baptist Churches in 1933 and the Conservative Baptist Association of America in 1947. Following similar conflicts over modernism, the Southern Baptist Convention adhered to conservative theology as its official position. In the late 20th century, Southern Baptists who disagreed with this direction founded two new groups: the liberal Alliance of Baptists in 1987 and the more moderate Cooperative Baptist Fellowship in 1991. Originally both schisms continued to identify as Southern Baptist, but over time "became permanent new families of Baptists." ^ a b Shurden, Walter (2001). "Turning Points in Baptist History". Macon, GA: The Center for Baptist Studies, Mercer University. Retrieved 16 January 2010. ^ a b c d e f g Gourley, Bruce. "A Very Brief Introduction to Baptist History, Then and Now." The Baptist Observer. ^ Benedict, David (1848). A General History of the Baptist Denomination in America and Other Parts of the World. Lewis Colby. p. 325. It is, however, well known by the community at home and abroad, that from a very early period they have been divided into two parties, which have been denominated General and Particular, which differ from each other mainly in their doctrinal sentiments; the Generals being Arminians, and the other, Calvinists. ^ "Baptist." 2010. Encyclopædia Britannica Online. ^ a b c Brackney, William H (2006). Baptists in North America: an historical perspective. Blackwell Publishing. p. 22. ISBN 978-1-4051-1865-1. ^ a b c Robinson, Jeff (14 December 2009). "Anabaptist kinship or English dissent? Papers at ETS examine Baptist origins". Baptist Press. Archived from the original on 19 June 2013. ^ Leonard, Bill J. (2003). Baptist Ways: A History. Valley Forge, PA: Judson Press. p. 24. ISBN 978-0817012311. ^ a b c Briggs, John. "Baptist Origins". Baptist History and Heritage Society. Archived from the original on 5 January 2010. Retrieved 10 January 2010. ^ Leonard 2003, p. 23. ^ Beale, David (2000). The Mayflower Pilgrims: roots of Puritan, Presbyterian, Congregationalist, and Baptist heritage. Emerald House. ISBN 978-1-889893-51-8. ^ Traffanstedt, Chris. "A Primer on Baptist History". Archived from the original on 3 February 2010. Retrieved 23 December 2009. ^ Leonard 2003, p. 24. ^ Nettles, Tom J. (Spring 2009). "Once Upon a Time, Four Hundred Years Ago..." Founders Journal. 76: 2–8. ^ Vedder, HC. "A Short History of the Baptists". The Reformed Reader. Retrieved 23 December 2009. ^ a b Leonard 2003, p. 25. ^ McBeth, H Leon. "Baptist Beginnings". Baptist History and Heritage Society. Archived from the original on 21 October 2007. Retrieved 19 October 2007. ^ Priest, Gerald L PhD (14 October 2010), Are Baptists Protestants? (PDF), Detroit Baptist Theological Seminary, Archived from the original on 20 June 2017 CS1 maint: BOT: original-url status unknown (link). ^ Burrage, Champlin (1912). The Early English Dissenters in the Light of Recent Research. 2. University Press: Cambridge. p. 222. ^ Melton, JG (1994), "Baptists", Encyclopedia of American Religions . ^ Torbet 1975, pp. 18–9. ^ a b c McBeth, H Leon (1987), The Baptist Heritage, Nashville: Broadman Press, pp. 59–60 . ^ Torbet 1975, p. 18. ^ The New park Street Pulpit, VII, p. 225 . ^ Mercer, Jesse (1838). "A History of the Georgia Baptist Association". pp. 196–201. ^ Slatton, James H. (2009), W.H. Whitsitt - The Man And The Controversy, Macon: Mercer University Press, pp. 278–279 . ^ Fletcher, Jesse C. (1994). The Southern Baptist Convention: A Sesquicentennial History. Nashville, TN: Broadman & Holman. p. 25. ISBN 978-0805411676. ^ Newport Notables, Redwood Library, archived from the original on 27 September 2007 . ^ Bumstead 1984, p. 40. ^ Bumstead 1984, p. 62. ^ a b Rawlyk, George A, ed. (1986). The Sermons of Henry Alline. Hantsport: Lancelot Press for Acadia Divinity College and the Baptist Historical Committee of the United Baptist Convention of the Atlantic Provinces. p. 32. ^ Bell, DG (1993), Henry Alline and Maritime Religion, Ottawa: Canadian Historical Association . ^ Early, Joe, ed. (2008), Readings in Baptist History: Four Centuries of Selected Documents, pp. 100–1, ISBN 9780805446746, retrieved 25 August 2010 . ^ Baker, Robert A. (1979). "Southern Baptist Beginnings". Baptist History & Heritage Society. Archived from the original on 18 October 2012. Retrieved 28 October 2012. ^ Moore, G Holmes (17 January 2010), 300 Years of Baptist History, Bible Baptist Church of St. Louis, MO, is an example of an independent Baptist church that has never been a denominational church in the sense of belonging to some convention or association . ^ "What are Baptists? London Baptist Association". LBA official website. Archived from the original on 28 May 2014. Retrieved 28 May 2014. ^ Cooperman, Alan (16 June 2004). "Southern Baptists Vote To Leave World Alliance". Washington Post. p. A4. Retrieved 4 November 2009. ^ "Appendix B: Classification of Protestant Denominations". Pew Research Center's Religion & Public Life Project. 12 May 2015. ^ "Baptist World Alliance – Statistics". Retrieved April 6, 2019. ^ "Statistics". Baptist World Alliance. Archived from the original on 27 June 2012. ^ Wanne, Catherine (2006). "EVANGELICALISM AND THE RESURGENCE OF RELIGION IN UKRAINE" (PDF). The National Council for Eurasian and East European Research. ^ Langer, Gary (18 July 2009), Poll: Most Americans Say They're Christian. Varies Greatly From the World at Large, archived from the original on 17 December 2009, retrieved 16 January 2010 . ^ Pendleton, James Madison (1867). Church Manual For Baptist Churches. The Judson Press. ^ "Church's elders cancel vote on membership without baptism". Baptist Press. Archived from the original on 19 June 2013. Retrieved 8 November 2011. ^ "Baptist Faith and Mission". Southern Baptist Convention. Retrieved 8 November 2011. ^ Nettles, Thomas J. "A Foundation for the Future: The Southern Baptist Message and Mission". Retrieved 17 January 2010. ^ Shurden, Walter B (1993). The Baptist Identity: Four Fragile Freedoms. Macon, Georgia: Smyth & Helwys Publishing. ISBN 978-1-880837-20-7. ^ Buescher, John. "Baptist Origins." Teaching History. Retrieved 23 September 2011. ^ "Baptists", Religion Facts, archived from the original on 10 January 2010, retrieved 17 January 2010 . ^ Pinson William M, Jr. "Trends in Baptist Polity". Baptist History and Heritage Society. Archived from the original on 13 October 2007. ^ a b Newman, Albert Henry (1915). A History of the Baptist Churches in the United States (3rd ed.). Christian Literature. ISBN 978-0-7905-4234-8. ^ Hammett, John; Hammett, John S (2005), Biblical Foundations for Baptist Churches: A Contemporary Ecclesiology, Kregel Publications, ISBN 978-0-8254-2769-5, One thing that all Baptists have in common is that everything is built upon the Bible. .
^ "Position Paper Concerning the IMB Policy on Glossolalia", Florida Baptist Witness, archived from the original on 28 July 2011, retrieved 18 March 2010 . ^ An Introduction to Bible Translations (PDF), Trinity Baptist Church Discipleship Training, April 2005, retrieved 18 March 2010 . ^ Beck, Rosalie (Response to 'The Ordination of Women Among Texas Baptists' by Ann Miller). "Perspectives in Religious Studies". Journal of the NABPR. Retrieved 18 March 2010. ^ Shurden, Walter B. Crises in Baptist Life (PDF). Archived from the original (PDF) on 12 January 2005. Retrieved 16 January 2010. ^ Christian 1926, pp. 404–20. ^ Christian 1926, pp. 421–36. ^ Baptists as a Percentage of all Residents, 2000, Department of Geography and Meteorology, Valparaiso University, archived from the original (GIFF) on 22 May 2010 . ^ "A Religious Portrait of African-Americans". Pew forum. 2009-01-30. ^ Spurgeon, Charles (4 March 1883). "The Best War Cry". Retrieved 26 December 2014. ^ Ashcraft, Robert (2003). Landmarkism Revisited. Mabelvale, AR: Ashcraft Publications. pp. 84–5. .
^ Bogard, Ben M. (1900). Pillars of Orthodoxy. Louisville: Baptist Book Concern. p. 199. .
^ Smith; Handy; Loetscher (1963). American Christianity: An Historical Interpretation With Representative Documents. II: 1820–1960. Charles Scribner's Sons. p. 110. .
^ "Guideline on Baptism". International Mission Board. ^ Torbet 1975, pp. 424–45. ^ Torbet 1975, p. 114. ^ Spurgeon, Charles (2009). The "Down Grade" Controversy. Pasadena, Texas: Pilgrim Publications. p. 264. ISBN 978-1561862115. Archived from the original on 23 June 2014. ^ Nettles, Tom (21 July 2013). Living By Revealed Truth The Life and Pastoral Theology of Charles Haddon Spurgeon. Ross-shire: Christian Focus Publishing. p. 700. ISBN 9781781911228. ^ a b Torbet 1975, pp. 395, 436. ^ Hefley, James C., The Truth in Crisis, Volume 6: The Conservative Resurgence in the Southern Baptist Convention, Hannibal Books, 2008. ISBN 0-929292-19-7. ^ James, Rob B. The Fundamentalist Takeover in the Southern Baptist Convention, 4th ed., Wilkes Publishing, Washington, Georgia. ^ a b Brackney, William H. (2006). Baptists in North America: An Historical Perspective. Wiley. p. 138. ISBN 978-1-4051-1865-1. Retrieved 16 May 2012. ^ Mead, Frank Spencer; Hill, Samuel S; Atwood, Craig D (2001). Handbook of Denominations in the United States. Abingdon Press. p. 46. ISBN 978-0-687-06983-5. ^ Leonard, Bill J. (2007). Baptists in America. Columbia University Press. p. 228. ISBN 978-0-231-12703-5. ^ "CBF History". Cooperative Baptist Fellowship. Archived from the original on 30 November 2010. Retrieved 16 January 2010. Bumstead, JM (1984), Henry Alline, 1748–1784, Hantsport, NS: Lancelot Press . Christian, John T (1926), History of the Baptists, 2, Nashville: Broadman Press . Leonard, Bill J (2003), Baptist Ways: A History, Judson Press, ISBN 978-0-8170-1231-1 , comprehensive international History. Torbet, Robert G (1975) , A History of the Baptists, Valley Forge, PA: Judson Press, ISBN 978-0-8170-0074-5 . Wright, Stephen (2004), Early English Baptists 1603–49 . Bebbington, David. Baptists through the Centuries: A History of a Global People (Baylor University Press, 2010) emphasis on the United States and Europe; the last two chapters are on the global context. Brackney, William H. A Genetic History of Baptist Thought: With Special Reference to Baptists in Britain and North America (Mercer University Press, 2004), focus on confessions of faith, hymns, theologians, and academics. Brackney, William H. ed., Historical Dictionary of the Baptists (2nd ed. Scarecrow, 2009). Gavins, Raymond. The Perils and Prospects of Southern Black Leadership: Gordon Blaine Hancock, 1884–1970. Duke University Press, 1977. Harrison, Paul M. Authority and Power in the Free Church Tradition: A Social Case Study of the American Baptist Convention Princeton University Press, 1959. Harvey, Paul. Redeeming the South: Religious Cultures and Racial Identities among Southern Baptists, 1865–1925 University of North Carolina Press, 1997. Heyrman, Christine Leigh. Southern Cross: The Beginnings of the Bible Belt (1997). Isaac, Rhy. "Evangelical Revolt: The Nature of the Baptists' Challenge to the Traditional Order in Virginia, 1765 to 1775," William and Mary Quarterly, 3d ser., XXXI (July 1974), 345–68. Life & Practice in the Early Church: A Documentary Reader, New York University press, 2001, pp. 5–7, ISBN 978-0-8147-5648-5 . Leonard, Bill J. Baptists in America (Columbia University Press, 2005). Menikoff, Aaron (2014). Politics and Piety: Baptist Social Reform in America, 1770-1860. Wipf and Stock Publishers. ISBN 9781630872823. Pitts, Walter F. Old Ship of Zion: The Afro-Baptist Ritual in the African Diaspora Oxford University Press, 1996. Rawlyk, George. Champions of the Truth: Fundamentalism, Modernism, and the Maritime Baptists (1990), Canada. Stringer, Phil. The Faithful Baptist Witness, Landmark Baptist Press, 1998. Underwood, A. C. A History of the English Baptists. London: Kingsgate Press, 1947. Wilhite, David E. (2009). "The Baptists "And the Son": The Filioque Clause in Noncreedal Theology". Journal of Ecumenical Studies. 44 (2): 285–302. Wills, Gregory A. Democratic Religion: Freedom, Authority, and Church Discipline in the Baptist South, 1785–1900, Oxford. McBeth, H. Leon, ed. A Sourcebook for Baptist Heritage (1990), primary sources for Baptist history. McGlothlin, W. J., ed. Baptist Confessions of Faith. Philadelphia: The American Baptist Publication Society, 1911. Wikimedia Commons has media related to Baptists. This page was last edited on 6 April 2019, at 15:11 (UTC).